For Deloitte, the song goes like this: Do the crime, pay the fine, the firm does no time, survive and thrive. The Public Company Accounting Oversight Board censured Deloitte & Touche LLP yesterday and imposed a $2 million civil penalty against the firm for violating the Sarbanes-Oxley Act and PCAOB rules when it permitted Christopher E. Anderson, a former partner, to perform or continue to perform activities as an “associated person” that were prohibited while he was subject to a PCAOB suspension order. Difazio has yet to be reinstated by the SEC but he’s been working for Deloitte ever since. 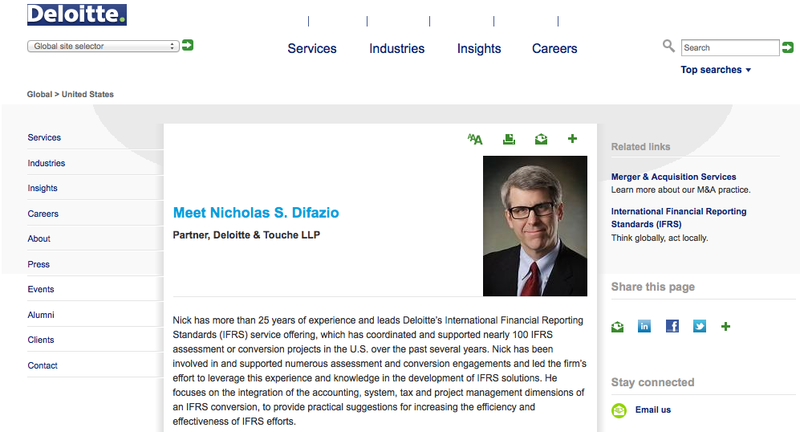 DiFazio is still a partner in Deloitte LLP, the public accounting firm, leading the firm’s IFRS practice. He advises issuers on IFRS conversion, writes whitepapers, stars in webcasts, and speaks to academics, regulators and issuer groups about the challenges and opportunities of changing accounting standards. 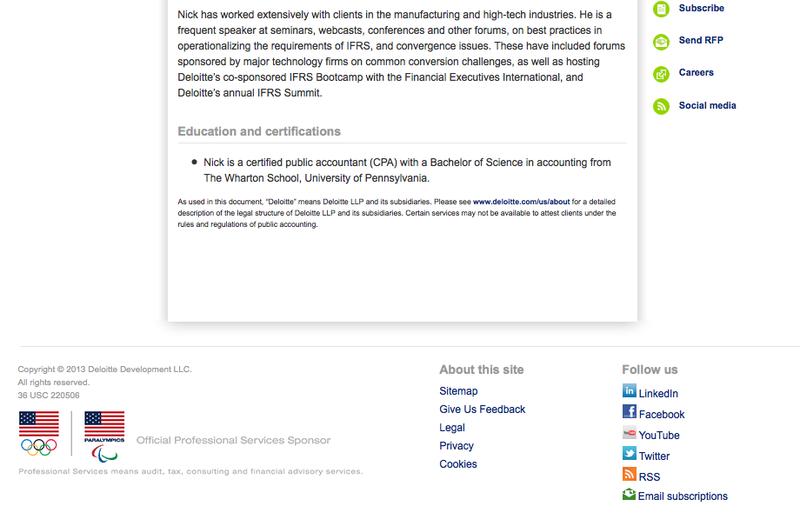 Until this week, you could also find him prominently featured on the Deloitte website. A search yesterday on Difazio’s name on the Deloitte site and on the URL where he was previously found produced a “404” error, information not found. Perhaps the firm is beginning to clean up its act. Deloitte settled lawsuits alleging its audits of Taylor Bean and Whitaker, according to Reuters, “failed to detect fraud at one of the biggest private mortgage companies to collapse during the U.S. housing crash.” The original claim against the firm was a catastrophic $7 billion. The complaint said, “Deloitte missed this fraud because it simply accepted management’s conflicting, incomplete and often last-minute explanations to highly-questionable transactions.” The settlement amount was not disclosed and Deloitte avoided a trial that was to start in Miami October 21. Deloitte was fined $10 million by the New York Department of Financial Services and banned for one year from working with the agency for “misconduct, violations of law, and lack of autonomy during its consulting work” at Standard Chartered Bank as a regulator-mandated monitor of fixes for anti-money laundering (AML) violations. Deloitte’s U.K. parent was fined an equivalent of $22 million by British regulators for conflicts of interest resulting from consulting services for the failed automaker’s owners while, at the same time, acting as the failing company’s auditor. A Pulitzer-prize winning journalist at the Boston Globe has been publishing a series on Deloitte’s state and local government systems implementation failures in Massachusetts, California, Florida and Pennsylvania, to name a few. Deloitte lost the most big banking and mortgage audit clients during the crisis and was sued over and over: Royal Bank of Scotland (where Deloitte is still auditor), Bear Stearns, Merrill Lynch, Washington Mutual, American Home, Novastar, Beazer and Taylor Bean and Whitaker. Mark Carney, the new Central Bank of England boss just hired Deloitte to advise on strategic cost cutting initiatives in partnership with McKinsey. That’s in spite of Deloitte’s ignominy as auditor of nationalized Royal Bank of Scotland, auditor of HP acquisition Autonomy, and the firm’s conflict of interests and betrayal of the public trust as auditor of failed MG Rover. McKinsey will work on a strategic plan examining the BOE’s priorities for the coming years and Deloitte will help conduct a “value for money” review focusing on operations including information technology and human resources, the BOE said today. Both companies were chosen after a competitive tender, it said. Deloitte was the “independent” foreclosure reviewer under the OCC/Fed consent decree for JPMorgan, even though majority of mortgages to be reviewed for “borrower harm” were from former audit clients Bear Stearns and Washington Mutual and the partner in charge of the JPM engagement for Deloitte was a partner on the WaMu audit. You may have heard JPM is readying to pay up to $13 billion in a settlement for mortgage fraud to a group of government agencies led by the Justice Department. According to Reuters reports today, $4 billion of the deal, intended to go toward aid for struggling mortgage borrowers, is tax deductible. Another $5.75 billion may go to a group of investors in mortgage-backed securities including asset managers and Deloitte audit client BlackRock Inc.
Deloitte has a culture of non-compliance with regulatory requirements, generally tolerated over and over by the SEC, DOJ and PCAOB, and best evidenced by its escape from public criticism for the Tom Flanagan inside trader scandal. Deloitte claimed its Vice Chairman “duped” the firm. I didn’t buy it in 2008 and I don’t buy it now. Flanagan, in comparison to the recent case of insider trading by a KPMG senior partner, actually traded on the information. Why didn’t Deloitte see the Flanagan issue earlier? Based on the SEC’s complaint, Deloitte was not aware until, presumably, the SEC started asking their clients a lot of questions. Deloitte didn’t have the process in place that the firms are supposed to have. Deloitte was also the first Big Four ever to receive a “pass with deficiency” grade on a peer review and the first to have its Part II report publicized by the PCAOB because of stubborn intransigence over acknowledging, let alone fixing, audit quality issues cited by the regulator during the crisis period. According to Monadnock Research, consulting revenue grew four times as fast as audit revenue at the Big Four last year. Consulting never stopped at Deloitte after Sarbanes-Oxley restrictions on services to auditors were enacted in 2002. A $2 million fine to the PCAOB, combined with $10 million to NYDFS, $17 million to UK regulators for MG Rover and up to $1 billion, estimated, for the Taylor Bean and Whitaker audit failure, is still only pocket change for Deloitte, a firm that reported global revenues of $32.4 billion for fiscal 2013. Deloitte is the best example in the Big Four of how a large consulting business corrupts an audit firm, obscures the auditors’ public duty and ruins their professional skepticism, squashes whatever shred of independence any of the partners or professionals may still shoot for, and will soon destroy any remaining vestiges of integrity for the accounting profession. Deloitte did not respond to an email request for comment on the recent disappearance of Nick Difazio from its website. The second to last paragraph is harsh but unfortunately will come to pass. Audits firms should only do audit and taxes for their clients (both are complimentary services that improve the quality of the other). Consulting should be banned outright. Doing so will make accounting firms either audit/tax or consulting in focus and will actually protect the industry in the long run. Also, the definition of client needs to be extended to create true “arm’s length” transactions in regards to current and former clients. As the current article points out, getting around the “arm’s length” standard is all too easy. Do I think the industry will do either? Unlikely in my lifetime and maybe not at all. Yes, it’s only money. And–more accurately, as you point out toward the end–it’s mere pocket change. A few days ago the New York Times ran a long feature about Leon Weidman (http://dealbook.nytimes.com/2013/10/30/from-anonymity-to-scourge-of-wall-street/?_r=0), an attorney the Times lauded for “pioneering use of the law — the Financial Institutions Reform,Recovery, and Enforcement Act of 1989, or Firrea…” to squeeze the $13 billion fine out of JPMorgan. The Times quoted Weidman as saying that corporations can’t go to jail, only individuals can. (Echos of your words, “It’s only money”). If that’s true how is it that Andy Fastow just got out of federal prison for his role in the Enron CRIMES. How is it that Bernie Ebbers is still behind bars for playing fast and loose with Worldcomms financials? And I do believe Dennis Kozlowski just go out of prison on a conditional basis. There are others–plenty of others who committed financial CRIME and went to jail….or, whose corporations committed such crimes. Does DOJ have a double standard? By Entron criminal law standards, it would not be far-fetched to conclude that Jamie Dimon, Llyod Blankfein, Angelo Mozilo and perhaps half a dozen current and former BofA executives should have by now at least faced criminal charges, if not been convicted. Must have something to do with those sweet Wall St connections to Treasury, the Fed and the White House. Who knows? And don`t forget about Parmalat insolvency. In that case Deloitte has to pay the record sum of 150 Mio.$ for not seeing the falsification of invoives and companies which didn`t exist.